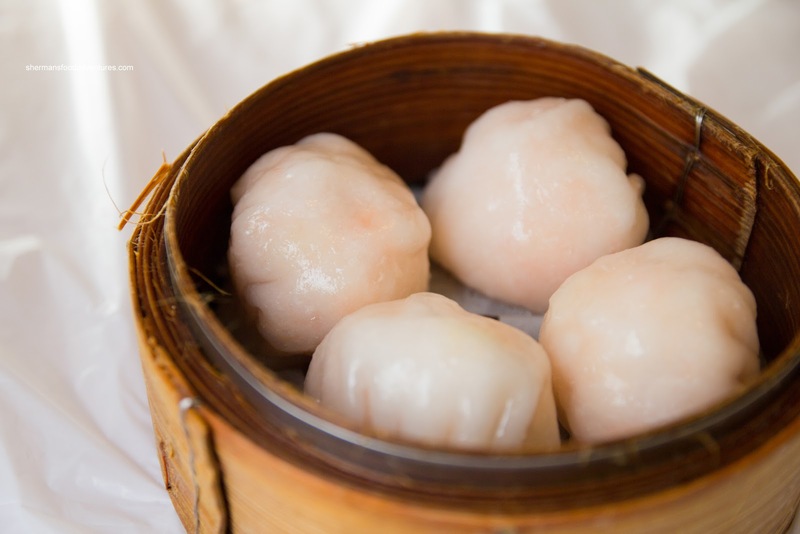 There once was a time where Chinatown was the schiz niz when it came to good Dim Sum. Well, that ship has definitely sailed... and probably sunk. Now we are left with Floata, Jade Dynasty and Garden Villa. No, that lineup of restaurants does not strike fear into any of the really good Dim Sum joints in town. How the mighty have fallen. It used to be all about Ming's, Park Lok and even yes, Floata. I guess the newer generation of Chinese folk don't want to waste their time circling for a parking spot, only to be spat on by lil' old Chinese ladies. 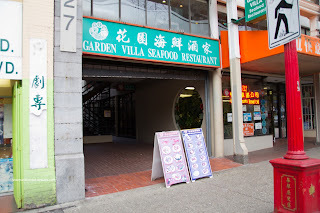 So it definitely was a walk down memory lane when we had a random food adventure at Garden Villa. Hey, we were at Science World and it just seemed like a good idea to search for eats in Chinatown. 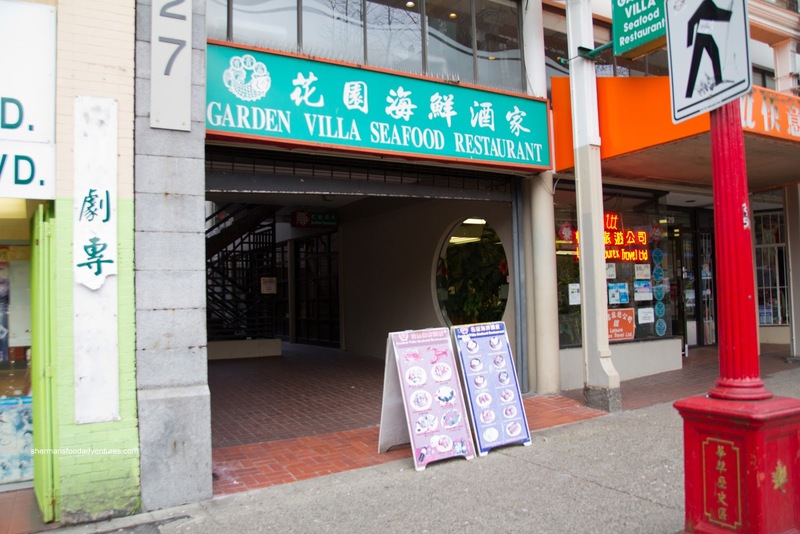 Since I was pretty young at the time, I vaguely remembered eating at Garden Villa (when it was something else). Apparently, not much had changed as the interior was pretty ol' skool and a little sketch looking. We ordered some items from one of the 2 ladies working (they were doing their very best, but were super-busy). 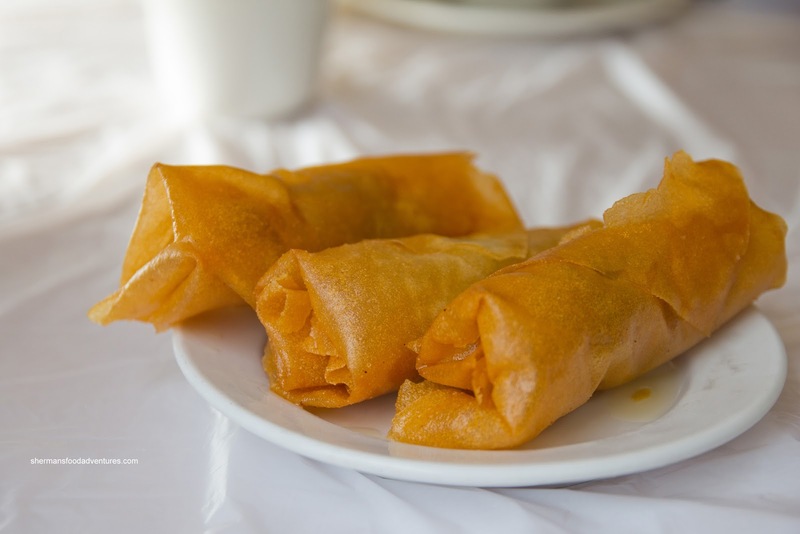 Looking haphazardly-prepared and soaked in grease, the Spring Rolls didn't appear to be appetizing. Well, the grease was off-putting, but the filling was quite tasty consisting of moist ground pork and lots of shiitake mushrooms. Next was another fried item being the Shrimp Mousse Stuffed Eggplant. Although the eggplant was cooked nicely (not being mushy), the shrimp mousse was a bit tough on the outside and somewhat chewy on the inside. There was just enough seasoning from the black bean sauce to accent the shrimp. When the Chicken Rice arrived, it was definitely ol' skool with large pieces of bone-in meat. I found it to be somewhat moist except for the white meat. In terms of flavour, it was quite mild and definitely benefited from the addition of sweet soy. The rice was not too wet, even after the dousing of the aforementioned soy sauce. Surprisingly, the Haw Gow (Shrimp Dumplings) were large and "modern-looking". It was a pity that the dumpling skin was very thick and doughy. On the other hand, the shrimp filling had a nice snap with large chunks. This was all for naught as there was practically no flavour. It was as if they forgot to season it. This was somewhat alleviated by some hot sauce. 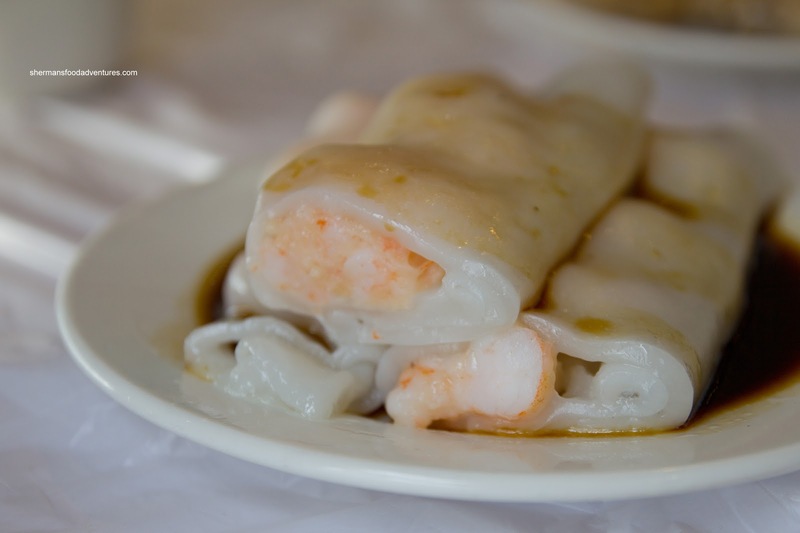 The Shrimp Rice Noodle Roll suffered a similar fate with possibly the same shrimp filling. 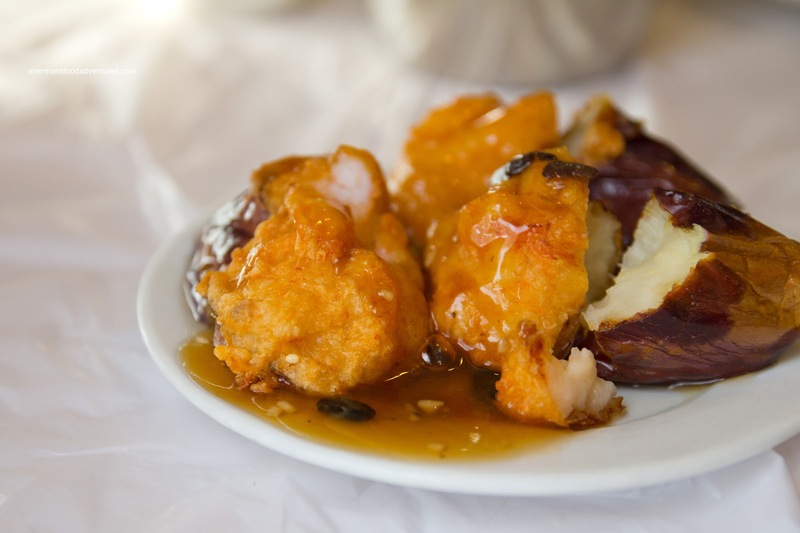 Much like the haw gow, there was a plethora of large shrimp pieces mixed in with mousse. Mostly, the shrimp had a nice snap, yet it was flavourless. Thank goodness there was soy sauce! As for the rice noodle, it was unusually thick, but it was super soft. Despite this, I would've preferred it to be thinner since it made the whole thing too heavy. 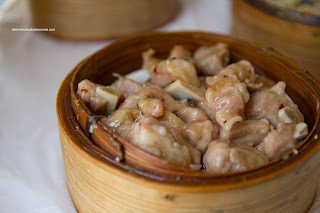 Onto another Dim Sum staple, the Sui Mai (Pork & Shrimp Dumpling) were lacking in texture. 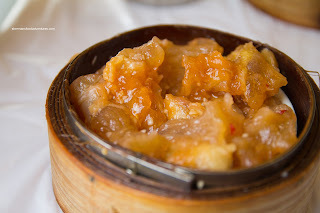 The ground pork was over-processed which made the entire dumpling too soft. Normally, the pork should be bouncy with a bite. However, the shrimp had a nice snap while the shiitake added flavour. The pork itself was rather bland. And the bland trend continued with the Steamed Spareribs. There was little distinguishing flavours. 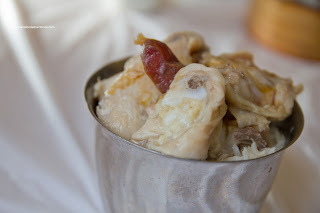 On the positive side, the ample amount of pieces were meaty and there was little in the way of fat nor cartilage. It could've been the luck of the draw, but we weren't complaining. Furthermore, the meat was tenderized just enough that there was a good chew and bounciness. For our only offal dish, we had the Szechuan Beef Tendon. There was very little in the way of spice, so it really didn't do its namesake justice. In fact, it was downright bland except for some garlic. In terms of texture, the tendon was on the stiffer side, yet still soft enough that we didn't need to gnaw at it. Lastly, for my son, we had his favourite dish being the Soy-Fried Rice Noodle Rolls. Without even describing them, you can easily see that there was far too much grease going on. It was as if they oil-poached the darn things as they were soaked with grease, yet curiously exhibiting very little pan-frying. Compounding the problem was the soft texture of the noodles where we couldn't even pick it up without it falling apart. This was a terrible attempt. Well, that was a disappointing end to a pretty average Dim Sum meal. Well, we really didn't have huge expectations for this random food adventure. 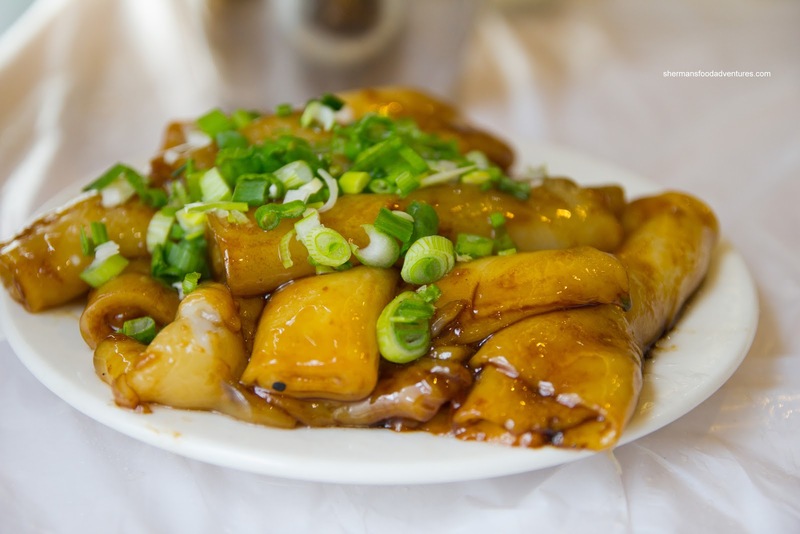 After all, the place is located in Chinatown where it screams out ol' skool. I guess it is okay for the "lo wah kui" (older generation of Chinese folk), but for us, we'd take a pass. - Um... It brought back memories of my childhood? @LR I suppose... with a side of horking and spitting. LOL ! And frequent saying of the "D" word (in Cantonese), hehehe.